Here at Wootric we’re big fans of Intercom. 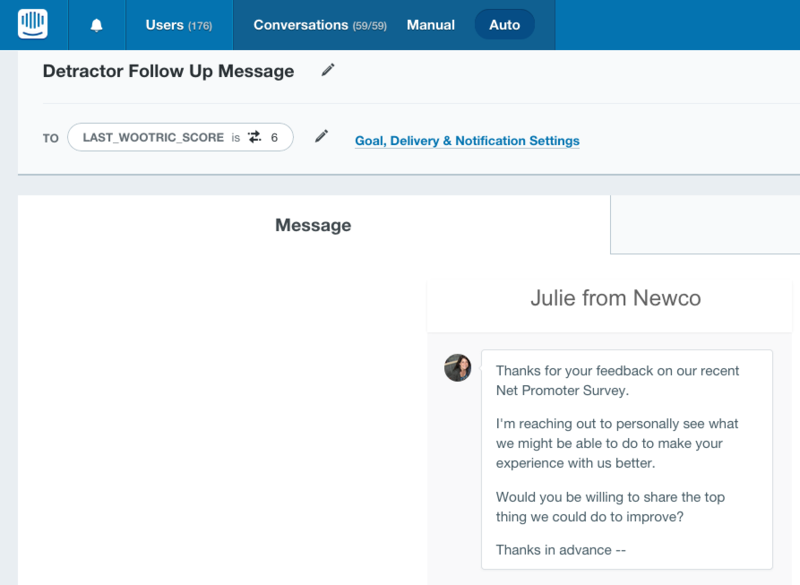 We are a customer feedback platform and we use Intercom ourselves to have meaningful conversations with our customers. Not surprisingly, our customers also tend to share the same passion for reaching their own customers where they are most likely to respond. We also believe that asking customers for feedback without proper follow-up is a cardinal sin in customer experience management. When survey feedback, such as Net Promoter Score (NPS), is coming in from your customers every day, it becomes something that you need to manage proactively. 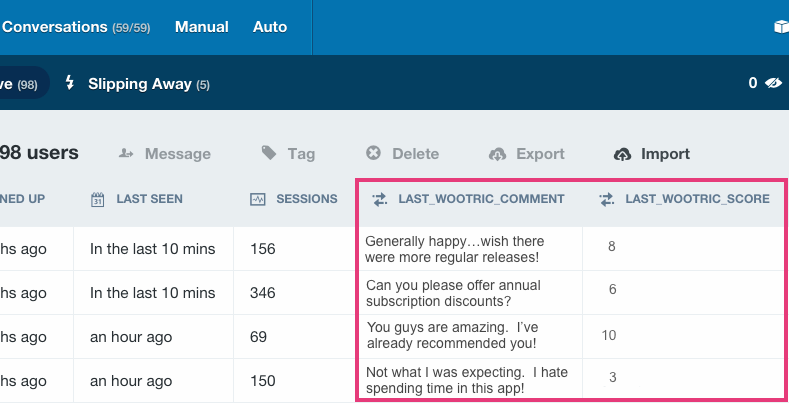 We’ve taken steps to address that by making follow-up an integrated part of the Wootric dashboard. But we also know that many of our customers manage their user conversations outside of Wootric. Rather than re-invent the wheel, why not combine forces? And so here we are, making the connection for Intercom users between measurement and proactive followup. Note: This process is essentially the same for our Customer Satisfaction (CSAT) and Customer Effort Score (CES) surveys. 2) Individual scores and responses get posted to your Intercom dashboard, and are also recorded as an event in the user record. Trigger Intercom messages to a user based on the score they provided. Perhaps you’d like to ping your detractors (scores of 0-6) that chose not to leave you a detailed comment, asking for additional feedback. Or maybe thank your promoters (scores of 9 or 10) and invite them to your referral program. You set the rules to drive meaningful interactions! Leverage NPS segments for future Intercom communication campaigns. This could be something like releasing and communicating new features to your promoters first. Or perhaps targeting specific passives with additional on-boarding to important features they might have missed. 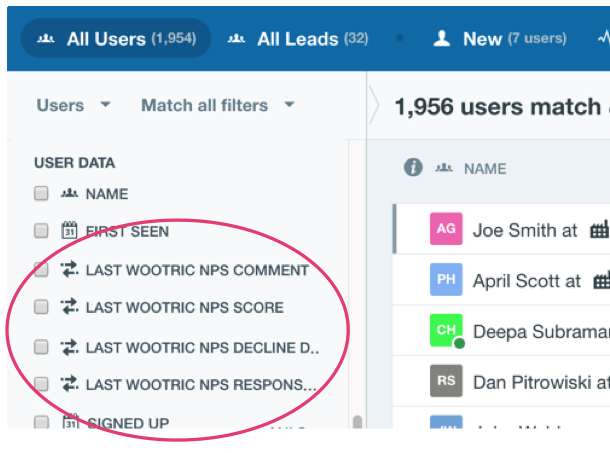 If you are an Intercom customer, simply click on this button to create a Wootric account (or sign in) and instantly connect it to your Intercom account. Use Zapier. With a free Zapier account, you can pass Wootric data to Intercom, or other applications, without touching code. If you are doing other creative things with Wootric and Intercom we’d love to hear about it! Measuring your NPS is just the beginning of your journey. Follow up in the ways that work best for your business, whether it’s through us, through Intercom, or another tool. We are here to support you in connecting the dots.